Image caption Grahame Colclough: "Nothing was whispered, rushed, or secretive"
When senior staff member Grahame Colclough and his partner Jon decided to get married, his head teacher made the announcement in a school assembly. She presented gifts to the couple who had "been together for years". "Nothing was whispered, rushed or secretive," Grahame remembers. Now, guidance from the heads' union NAHT urges all schools to be similarly supportive of lesbian, gay, bisexual and trans staff who want to reveal their sexual identities in classrooms. Billed as the first of its kind in the UK and endorsed by the campaign group Stonewall, the guidance covers key issues faced by LGBT staff - such as harassment, discrimination, bullying and lack of visibility. It also lays out the role and responsibilities of school leaders in creating workplaces where "staff can feel safe and be open with colleagues and with pupils". The NAHT says 2014 research from Manchester Business School found that individuals from sexual minority groups were more than twice as likely as heterosexuals to be bullied or discriminated against in the workplace, with knock-on effects on their physical and mental health. It also notes that a 2016 review for the government's Equalities Office found very high levels of workplace bullying and harassment against trans people. The guidance advises heads to take personal responsibility for promoting inclusion and tackling bullying based on sexual orientation. "We haven't made as much progress as we should on LGBT-plus rights in schools. "We need to change that," said NAHT general secretary Paul Whiteman. "Schools decide the kind of society that we have, they transform children into citizens of the world and if we aren't getting the treatment of LGBT-plus pupils and teachers right in schools then we won't be getting it right in society. "It shouldn't take bravery to be yourself or to stand up for your colleagues' rights, but it does sometimes. "This can have a serious impact on the mental health, happiness and motivation of school staff as well as pupils." The union's equalities group chairwoman, Sally Bates, said that while some LGBT-plus staff chose not to be open about their sexual orientation, too many others kept quiet for fear of discrimination, bullying or harassment. Nick Ward, director of Teach First, said he wanted a world where teachers are "not just permitted but supported and encouraged to discuss their sexual and gender identity in order to provide what all teachers aim to provide, a role model for their students". 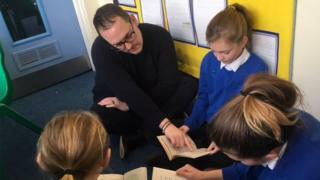 Troy Jenkinson, a Leicestershire primary head teacher who is open about his sexuality, said: "It is crucial for us to get it right now in our schools so we can prepare our students for accepting diversity as they become the next generation of adults. "In the words of one of my Year 6 pupils, 'Love is love.'" The NAHT wants all schools to behave like Grahame Colclough's where he says the wedding announcement was "perfectly normal and exactly how it happens for all of the staff in our school who are getting married". The guidance will be published next week on the NAHT website.